"Here's a simple sausage gravy with an Italian flair that's served over hot biscuits." Cook sausage in a large skillet over medium heat until no longer pink, following cooking instructions indicated on the packaging. Add diced onions and continue to cook until onion softens and turns transparent. Drain fat. Stir in the Alfredo sauce, sage and black pepper. Bring to a simmer, stirring occasionally; reduce heat and simmer for 10 minutes. Serve over fresh biscuits and top with green onion. 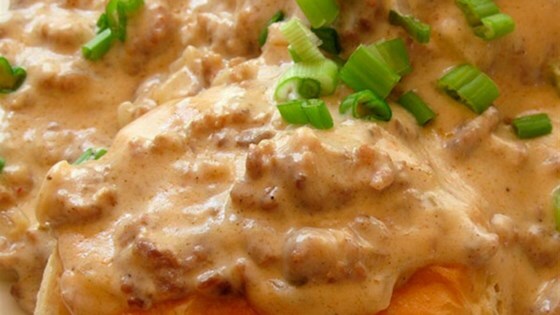 Simple and tasty sausage gravy! Made it exactly to recipe. Thought it was a bit salty, maybe the red wine I was drinking made my tongue sensitive. My wife loved it, so I'll give it 3 stars. Will try one more time. A bit saltier than I expected but still a nice occasional change from regular biscuits and gravy.